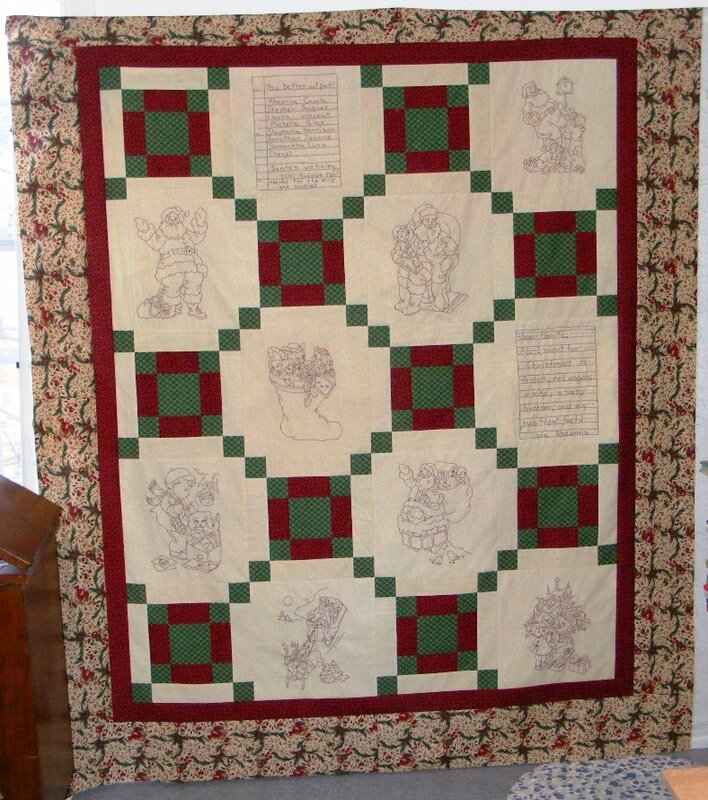 Quilting Adventures: Blogland .... We've got a finish...! That's right, I finally took the time to put that last border on Santa's Comin' to Town. I just love how it turned out! Now to figure out how I'm going to machine quilt it! I thought of using monofilament thread as it would not show when I cross over the hand embroidery but ... I don't know if that's what I want on a quilt that will be used! It's already been claimed by dd. Gotta love her! Why not monofilament? It won't scratch her and it will let all of your beautiful handwork shine! It came out beautifully and love the fabrics you used. I use cotton or polyester, whatever I have on hand and what is one sale, lol. I quilted an embroidery quilt in matching thread to the background and went right over the embroidery threads. Looked fine. Maybe do a test with anything you decide on. Wow, that was fast! It's adorable! Do you have to quilt through the embroidery? Can you just quilt around it??? C'est magnifique Carole, j'ai hâte de passer a la boutique pour la voir.C'est toujours aussi beau ton travail.. I hope you have fun with BYW and your new camera!